For the sartorially evolved techies among us, there is a T-shirt with a sound-sensitive, LED-powered equalizer, useful for that outing to a discotheque. Then there is a USB mini cooling fridge and a voice recorder that is also a pen. These are gizmos almost out of Star Trek. And there are more. For workaholics glued to their workstations all day, there’s a mini massager, as well as a mini vacuum cleaner for their desks. Let the adventure begin! This contraption isn’t much of a cooler. We would rather call it a chillness maintainer. The thermometer pegs its cooling ability at 14 degrees Celsius, and it holds one can. But with this device, a cold drink that you would usually gulp down can now be nursed at ease. This torch runs on three AAA batteries and has five bright LEDs. You can mount it as a table lamp, closet lamp, in your car, underneath your desk, or anywhere you can attach the dock. When the need arises, you can grab it and go! The batteries supposedly last 35 hours. If you have the habit of performing every action in your life to a beat, now you can do the same in the bathroom, with a Shower Radio. It runs on two AAA batteries, and has a one-button scan feature. Go ahead and have a beat-off (read dance-off) while in the shower. Or if you can get your hands on a cheap FM transmitter, transmit weird creepy noises when your pesky roommate is in the bathroom. Sweet revenge! Like incense sticks but deterred by the fact that your office has a fire policy which doesn’t allow you to burn any? Try this gadget. It comes with a bottle of aromatic oil, or you can use fragrant oils from your local spa to get started on aromatherapy within your office or home. This is, simply put, a handset with an answering button, in the shape of an old-school telephone, but it’s far too cool to ignore. It plugs into your phone via a regular 3.5mm jack. The health benefits include saving your brains from exposure to cellphone radiation. Meant for the keyboard warrior, this nifty little accessory is a Bluetooth slider Qwerty keyboard case for the iPhone 4. If you’re one of those people who just can’t do without a physical keypad, and has put off purchasing an iPhone because it doesn’t have a keyboard, this gadget is for you. The accessory hooks up to your iPhone 4 via Bluetooth and you can supposedly start typing as soon as you slide it out. The case even offers some amount of drop protection. The price may be a little steep, but for someone willing to spend upwards of ₹ 30,000 on an iPhone 4, it may fall into the affordable category. A cool gadget to play with, a Levitron is great for improving hand-to-eye coordination. You get a set of weights to adjust the height of the magnetic top. We found it to be a great gift. The fun you can have with this magnetic in-air suspending and hovering gyro is endless. If Gene Krupa or Buddy Rich were still alive today, they could have tried this gadget and given us a proper review. But, alas, you’ll have to make do with us. For learners, getting a decent drum kit can be quite a pain, with second-hand kits starting at ₹ 7,000 and new ones costing close to ₹ 20,000. This drum kit makes for a good gift for youngsters. Moreover, it is compatible with Sonar, Cubase and Nuendo. But people who are serious about drumming should give this a miss and get a proper kit. It’ll wake you up to either a rooster crowing, a cow mooing or a sheep baaing. What’s more, it has a small slit on top—to shut the alarm off, you must insert the key representing the animal corresponding to the sound heard, else it gets louder and louder. For fun, you can hide it underneath your sibling’s bed. The Farmland Alarm Clock runs on three AAA batteries. There’s just something so charming about a handful of perfectly sharpened pencils lying in a row on your desk, isn’t it? But if you don’t want to spend hours sharpening them, get this USB Pencil Sharpener. If we put a USB fridge on this list, we simply have to put in a USB warmer for our readers from the cooler regions. There is an inbuilt four-port USB hub too. A great way to brew a cup of coffee or tea without leaving your table even for a second. And if you want a quick snack, just heat water and add a packet of instant noodles. Quick and easy—that is what this device is all about. Before you jump to conclusions, be warned, this is not that kind of a charging station. It is meant for your gadgets, and does a fine job of hiding the cable clutter that your power-hungry gizmos are bound to create. 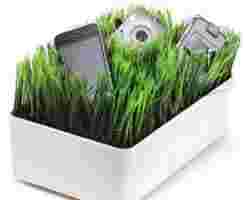 A compartment under the faux grass accommodates all your adaptors and has hoops to wind the excess cable. However, since it’s from Amazon, you may incur excessive shipping costs. So tread with caution on this one. One of the most ingenious low-tech solutions to a very common problem: How do you prop up your phone when you’re sitting back and watching that 58-minute...er...educational clip? The iPlunge (which can also work with non-iPhone touch screens) clips on to the back of your device and props it at a convenient viewing angle, leaving your hands free to tend to other things. 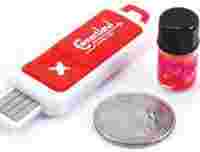 It works on any desk, table, plane or train where you might want to keep your phone. On a weekend getaway to the countryside, the thing that you want to do most is update your Facebook status or make that one conference call pretending to be in office. But you can’t do any of that because your phone’s battery has run out.This wrist charger is your saviour. It is in effect a 1,500 mAh battery pack that you can use even while operating the device. We still advise you to enjoy and have fun on your weekend getaway. Is your employer getting on your nerves? Feel like performing some manoeuvre out of Whackyourboss.com? You might want to give this gadget a try instead. The Stress Reliever Electronic Bubble Wrap Keychain has eight buttons that are supposed to feel like the real thing—when you “pop" any one, it makes a sound. What’s even better is that every 100th “pop" is a different sound—a fart, a bark or a burp. Instead of gritting your teeth, now just pop the bubbles and deal with your frustration. Are you a heavy sleeper? Maybe a quick workout as you wake up is just what you need to get you on your feet. Grab the Run-Around Wake-Up-n-Catch-Me Digital Alarm Clock on Wheels—this little gadget comes with a pretty loud speaker, capable of putting out 80dB while running across the room from you. This all-in-one gadget combines a pen, laser, LED torch and, the best part, an extendable baton. Whip this little thing out of your pocket and show the neighbourhood bully who’s boss. Also useful for professors of a more disciplinary nature. This is the equivalent of using an Etch-a-Sketch as a mouse pad. You get a stylus along with the mouse pad. Even if you can’t find one when you need it, just use your fingers till you can copy it elsewhere. It’s great for note-taking as it provides the feel of using a pen without wasting paper. A T-shirt with a sound-sensitive, visual, LED-powered equalizer! What could be cooler? A must-wear to the disco—or even to college—this T-shirt makes a definite style statement. Powered by four AAA batteries. The only drawback? It isn’t machine-washable. A devious device, this pen is actually a voice recorder masquerading as a pen. Charge it, insert a TF card of up to 16 GB and place it wherever you like. It will automatically start recording when it detects volume levels of over 60dB. This is an ideal tool to have handy when your car’s safety devices turn against you. With a hammer capable of smashing the toughest automotive glass, a pin to deflate that pesky air bag and a knife to slash your way through the tangled mess that is your seat belt, the SOS CarMate is handy in case of an auto emergency. *Please check individual websites for shipping policies and rates.